Sealed Concrete – Sealed concrete is a low-cost method to protect the surface of the concrete flooring. Because concrete is naturally porous, water, dirt, oil and other elements can seep into it and damage it at a foundational level, if not sealed properly. 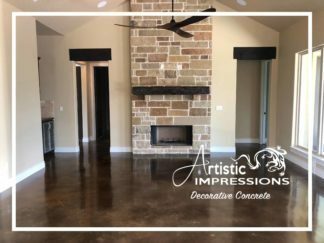 Artistic Impressions uses a quality acrylic sealer that bonds with the concrete to produce either a matte or glossy finish. After sealing, the concrete is protected from damaging elements and is easier to clean and maintain. Alternative sealers can be used depending on your exact needs: epoxies, polyurethanes, polyureas, and polyaspartics. 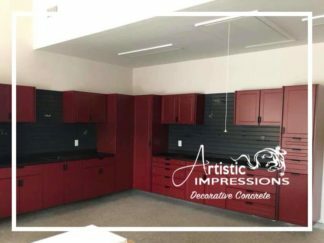 Stained and Sealed Concrete – Staining and sealing concrete is another excellent way to enhance the look of your concrete with color. Typically a 3 day process, staining and sealing is an application commonly used on floors. The process involves using an environmentally safe and pleasant-smelling cleaner to open the natural pores in the concrete, the translucent dye or acid stain is applied and allowed to soak into the concrete. Finally, after removing any residue the sealant is added to lock in the color. Because the dye or stain that we use is translucent, the natural character of the concrete can still be seen. Micro-topping Overlays – Overlay concrete offers multiple benefits for your concrete: it is a great way to beautify and revamp your existing concrete. Recommended for interior concrete, you choose from 30 colors and have endless options for design and patterns. Artistic Impressions floors are especially useful for rentals, as they have little maintenance and offer an excellent alternative to carpet. Epoxy Floor Coatings – Help protect your concrete investment with Artistic Impressions epoxy floor coatings. This all-purpose coating is available for residential, commercial, decorative and even industrial projects. 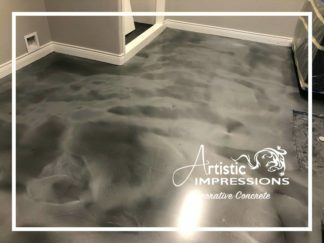 Our epoxy floor coatings increase the longevity of your interior or exterior concrete, and won’t peel off with heat or after 1-2 years like the kit you get from the hardware store. The benefits of the coating are immediate: The concrete is protected from everyday wear and tear, becomes slip and chemical-resistant, and its overall appearance is improved, in addition to the floor becoming easier to clean and maintain. Epoxy Flake Coatings – The epoxy flake system creates a decorative finish that also acts as a durable protective wear surface. It consists of decorative vinyl color chip, flakes or fleck that are specially formulated paint aggregates used to enhance the aesthetic qualities of seamless, resin-based chip/flake flooring systems. The decorative paint chips are randomly or fully broadcasted to rejection into an epoxy base coat, and then the chips are sealed in with a clear topcoat. Epoxy Quartz Coatings – Epoxy quartz systems are used for decorative purposes in light and medium duty traffic areas. A colored quartz aggregate is broadcasted into a clear high solid epoxy binder to create a decorative floor finish that is suitable for most commercial and industrial applications. This epoxy floor system is aesthetically pleasing and creates a durable, slip-resistant, chemical resistant surface. This is a seamless flooring system, it is easy to clean and maintain. Unfortunately we do not pour concrete or stamp concrete but do know the right people to help you.